[Artists Support]: Danny Howells, Luke Slater, Gary Beck, Sasha, Jamie Stevens, Satoshi Fumi, Vril, Pablo Bolivar, Dubfire, Roberto Capuano, Pascal Feos, Richie Hawtin, Alland Byallo, Nadja Lind, Jamie Anderson, Angel Molina, Horatio, Mike Vamp, and many more. [Press/Radios Support]: Resident Advisor, De:Bug, Different Grooves, Dj Mag Spain, Ibiza Global Radio, Ibiza Voice, Dinamo.FM, Clubber.rs, DjBroadcast, Tunnel FM, BLN.FM, Clubbing.FM, Soe.FM, The Noise Gate Magazine, The-Zone.it, Extra Music New, Radio Chry Toronto (Diversions), Knights Of The Turntable, and many more. 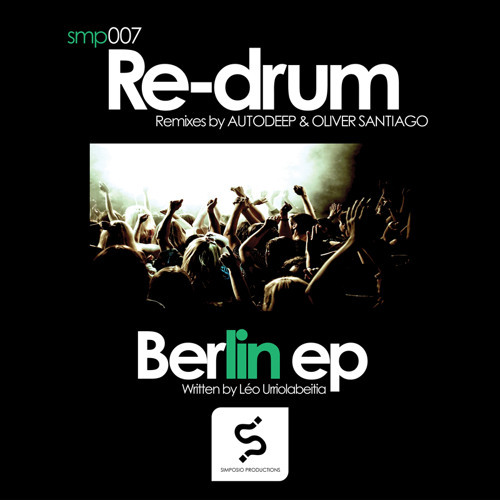 Artist: Re-Drum Title: Berlin EP Remixes: Autodeep, Oliver Santiago Label: Simposio Productions Format: Digital + Limited CD copies. Cat. No: Smp007 Release Date: May 19, 2014 http://www.simposioproductions.com Artists & Press Feedbacks: http://goo.gl/7d571m [REVIEW]: Re-Drum (France) is a very young artist, one of the new minds involved in Simposio with a musical conception respected by names like Laurent Garnier or Pablo Bolivar. He presents "Berlin EP", 3 original tracks plus 2 remixes included by Autodeep (Germany) and Oliver Santiago (Spain). "Berlin" and "You Are This" are the main songs around this EP, where Re-Drum plays his guitar getting sweet melodies through the bass knocking your face. The other original track is "Berlin (Dub Mix)" working perfectly as alternative to the original track, a bit more dub. About “Berlin” remixes: Autodeep signs a brilliant remix (slo-mo disco) making amazing melodies remaining in your brain forever. Oliver Santiago gets other taste for his techno version, more focused on the dancefloor and just for the most demanding audience.